How did pickleball come to these parts? Charles Kuehn, who bought a house in Tanglewood in 2005, went back to Virginia in the summer of 2006 and was invited to try a game of indoor pickleball. He tried it, liked it, researched it and returned to Tanglewwood with a fire burning in his belly. He was determined to get the game started in his own community. Not sure how to go about it, he talked to some of the movers and shakers who led him to the park's owner, John Greytak. 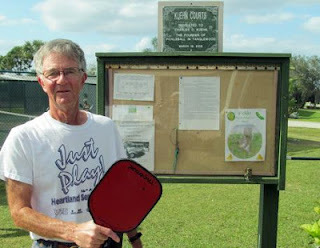 After a few meetings with Greytak, Kuehn bought $600 worth of equipment, got permission to set up two temporary courts on the outdoor dance floor and within a month of being back in Tangledwood was "selling" the game to everyone he met by carrying his wooden paddle and whiffle ball with him.